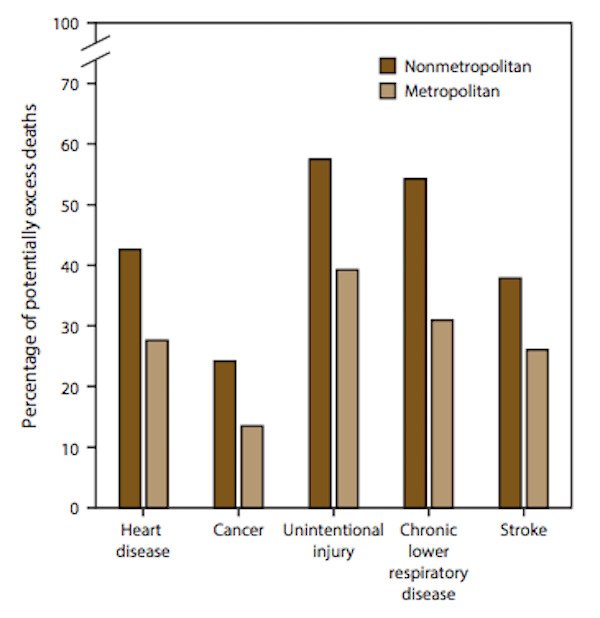 Notes: Figure shows five leading causes of death. For each age group and cause, the death rates of the three states with the lowest rates during 2008−2010 (benchmark states) were averaged to produce benchmark rates. Potentially excess deaths were defined as deaths among persons aged < 80 years in excess of the number that would be expected if the age group–specific death rates of the benchmark states occurred across all states. Data Source: National Vital Statistics System, United States, 2014. This entry was posted in Medicine and Society Data Watch on January 18, 2017 by Genevra Pittman.